Status: Totally depotted, circuit traced out, schematic generated, restuffed and working. Starting to de-pot the bottom. The torch and knife I use to de-pot can be seen in this pic. De-potting is going along nicely. 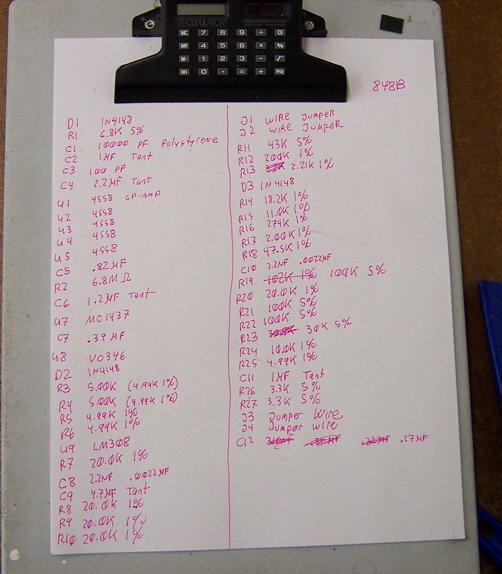 Once the bottom was complete de-potted, I photocopied it so I could keep track of the parts that were tested and removed. The top is started. I have removed one row of chips and a bunch of parts so far. Unfortunately, there is no way to safely de-pot the parts, so I am de-potting down to the part lead, cutting the lead, testing the value of the part, then removing it. This seems to be the best way to go, since I can be guaranteed a good part reading in case it gets destroyed. Each reading I have taken has matched up perfectly with the part when it is identifiable. 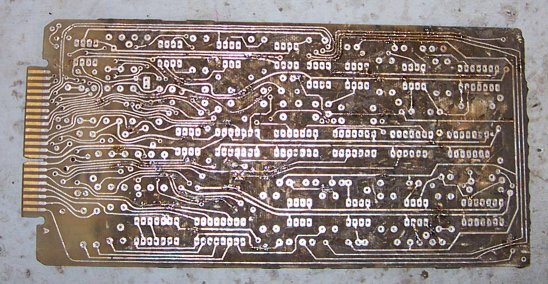 At this point, half of the board has been stripped down to the bare PCB. There are some nicked and messed up routes, but this is no big deal. They will be fixed and all routed tested before parts are installed. Kind of a side angle showing some more detail. That potting is thick! It's around half an inch or so. I've been using a heat shrink gun to do the top- it works really well and I can chip out the epoxy without too much issue. This work generates ALOT of chunky epoxy goodness. There's some white RTV mixed in too. I almost like removing the epoxy better than the RTV. The RTV is really really rubbery and hard to remove from the PCB. Here's the parts list as it stands, so far. The part locations are marked on that photocopy, but it's hard to see in the picture. Everything is being done very methodically so that it can all be put back together later. I will be using new parts when I reassemble the board. 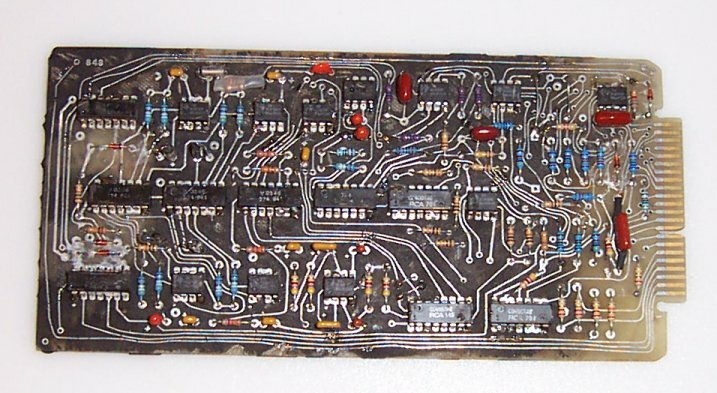 The board has been stripped down and all broken routes were found and repaired and tested. 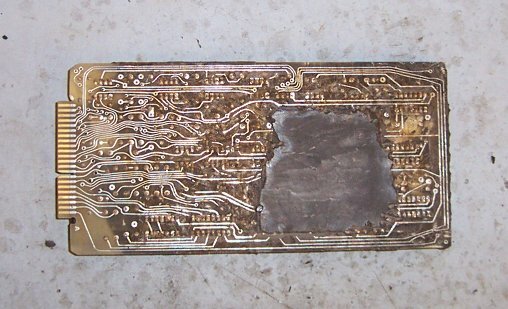 The bottom after the same treatment. The resistors and diodes have been installed and checked. And now the resistors and caps are installed. 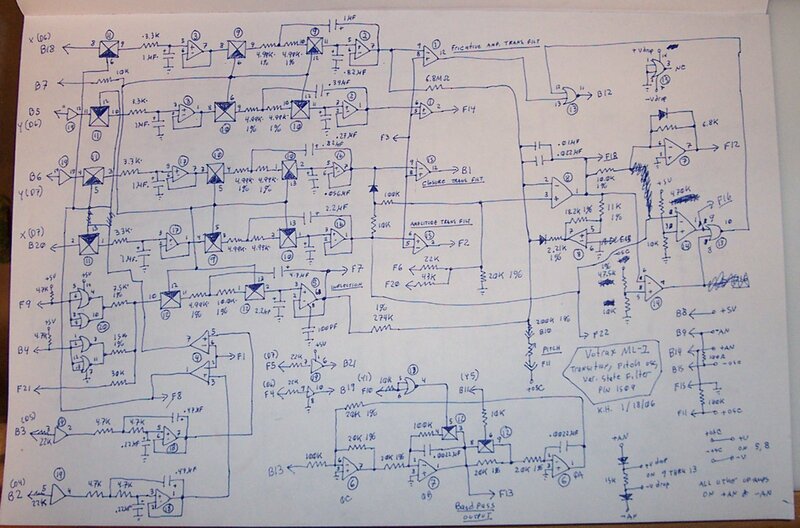 I did not install the chips, because I had to totally check out the board and trace out the schematic for it. This has now been done. I will be putting the chips on next. 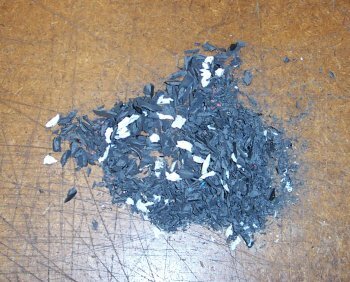 The chips have been cleaned of their residual potting compound, they have been fully tested, and are ready to be reinstalled. 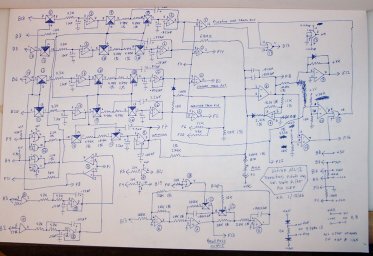 I tested the logic chips with my handy-dandy chip identifier/tester, and the op-amps were tested by building a triangle wave oscillator. I used the amps in buffer mode and checked for distortion, etc. All chips passed these tests. After this test, I definitively identified what the V0346 chips are- They are 4016's. The on resistance matches that of a 4016 (instead of a 4066 which has a lower on resistance). 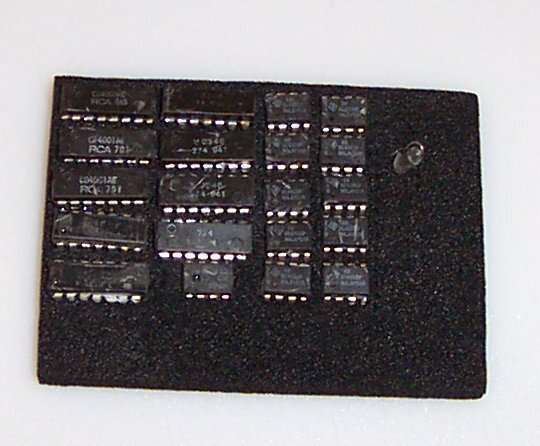 The pinout and functionality are the exact same as a 4016, and the off resistance matches too. So, this is definitively what it has to be. And here's the finished product. It is 100% re-assembled and tested. Everything works as well as it did when it was potted. 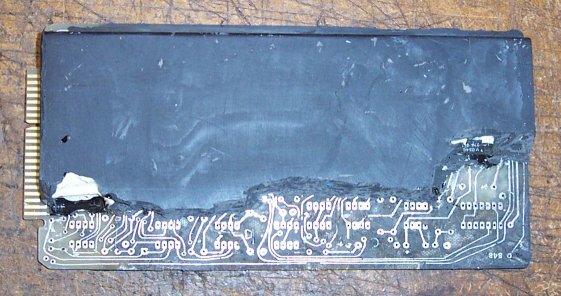 I will be spraying this board with conformal coating to protect the fixed routes and to make it look nice and shiny. I will also put some heatshrink on a couple of the capacitors that are standing up so that they won't short out on the card cage frame. 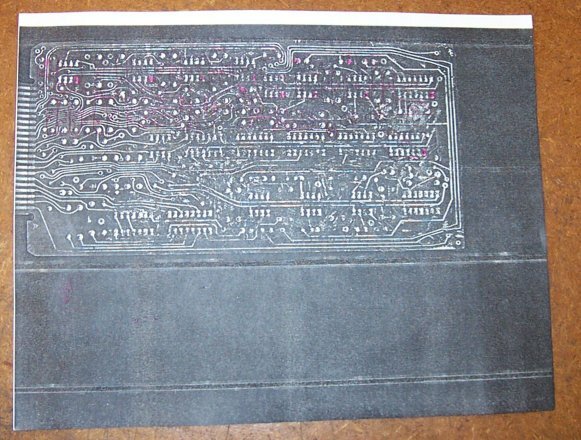 The board is now fully depotted and the schematic has been traced out. 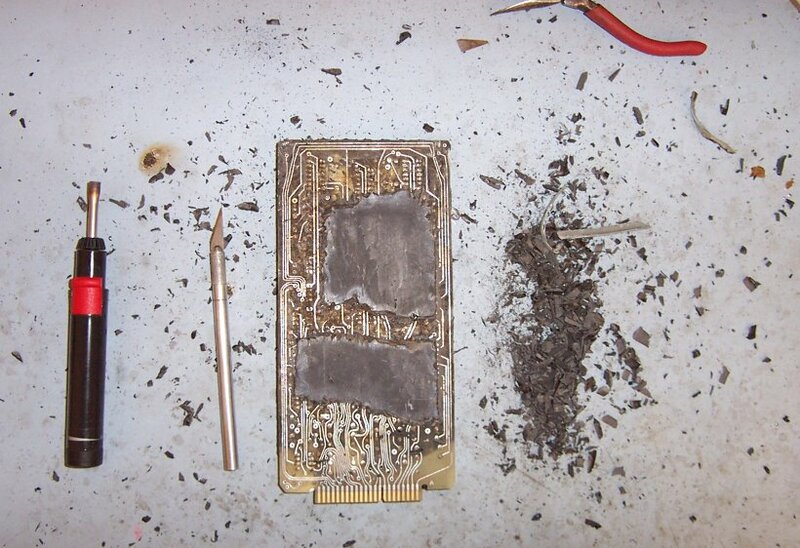 Those funky V0346 chips have been identified probably. I suspect they are 4066's or something very very very close to it. I will test them soon to see what happens when I dork with it. As for what's on here, this board has three separate sections to it. There's the transition generators, a state variable active filter (in bandpass mode), and the voiced sounds oscillator. 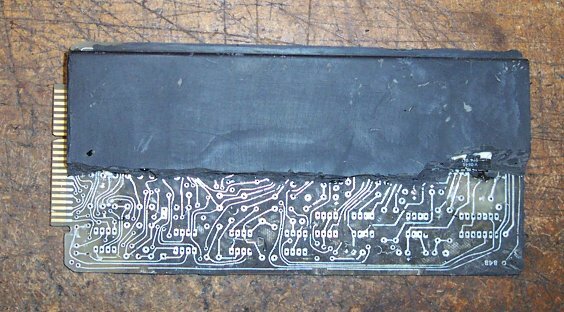 The pitch knob connects to this board, and it also has a 3 bit DAC made up of some resistors to control inflection. The transition generators are pretty neat- they accept a PWM input, convert it to analog, lowpass filter it, then convert it BACK into PWM! They seem to be chopper stabilized, hence all the V0346's (which are probably 4066's). 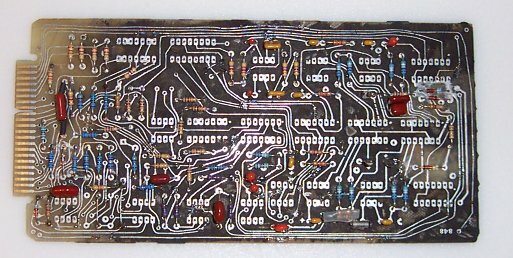 There's alot of weird analog juju on here, and alot of it makes sense, but all of it will make more sense once more boards are unpotted.